Fully equipped luxury penthouse apartment with private pool on Spain's Costa del Azahar in the El Pinar hillside. 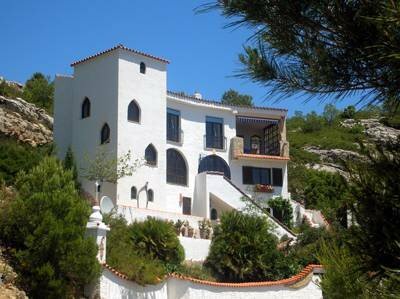 Enjoy peaceful sea views over Las Fuentes, Alcossebre and Mediterreanean. The El Pinar hillside is the beautiful pine-covered backdrop to the village of Las Fuentes and the town of Alcossebre on Spain’s Costa del Azahar (Orange Blossom Coast). Our fully equipped and beautifully furnished apartment is set on the south facing hillside of El Pinar with spectacular views over the Mediterranean sea, Las Fuentes marina, beaches and coastline of the town of Alcossebre. This penthouse apartment is the top floor of private Villa 'Castillo de Azahar' with a private swimming pool looking right out to sea and offering an idyllic peaceful location just a few minutes drive away from the beaches, restaurants and town. The apartment is fully furnished with indoor and outdoor terrace dining areas, and a large private sun terrace - all with amazing views of the coastline. The area’s best restaurant 'The El Pinar' is only a short walk away. There are 2 excellent golf courses within 45 minutes and boat trips to the Columbretes Islands which are 28 miles from the coast. The position and views from this property are simply stunning. Peaceful yet very close to all the facilities make this a very special place. Valencia, Barcelona and Castellon are all in easy driving distance and well worth visiting.